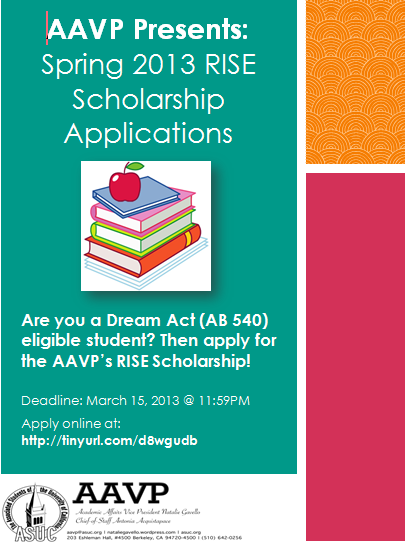 On behalf of the ASUC, I would like to announce the RISE Scholarship, a scholarship I have been working on with AAVP Natalie Gavello, Senator Daley Vertiz, Senator Donna-Jo Pepito, and Senator Sidronio Jacobo for AB 540 students at UC Berkeley. We are awarding up to $1,000 per applicant that is chosen. Please follow the link above to apply. For further questions, do not hesitate to contact Senator Lieu at klieu@asuc.org.